In order to become a cochlear implant candidate, a trial period with hearing aids programmed to your hearing loss is required. Let’s rephrase that…if hearing aids do not help you hear better due to severity of your hearing loss, the last resort is to explore sensorineural (cochlear implant) surgical options. Not to beat the dead horse, but…you MUST wear hearing aids before you can become a cochlear implant candidate. The externally worn microphone, sound processor, and transmitter system which are connected by a magnet to the implanted receiver and electrode system. The implanted receiver and electrode system contains the electronic circuits that receive signals from the external system and send electrical currents to the inner ear. A cochlear implant is very different from a hearing aid. Hearing aids amplify (acoustically) sounds so they may be detected by damaged ears. 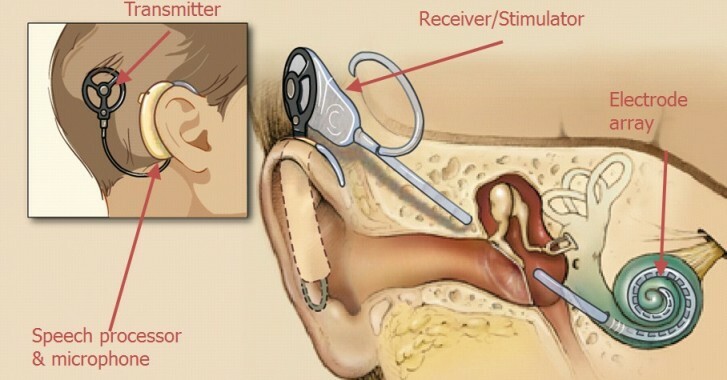 Cochlear implants directly stimulate (electromagnetically) the auditory nerve. Signals generated by the implant are sent by way of the auditory nerve to the brain, which recognizes the signals as sound. Hearing through a cochlear implant is different from normal hearing and takes time to learn or relearn. Candidacy of a cochlear implant requires both a surgical procedure and significant therapy to learn or relearn the sense of hearing. The decision to receive an implant should involve discussions with medical specialists, psychologists, and audiologists/speech pathologists. Just as with any kind of surgery, complications are always a risk factor. An additional consideration is learning to interpret the sounds created by an implant. This process takes time and practice as you are re-training the brain and auditory system to learn how to hear and process speech. Prior to implantation, all of these factors need to be considered. What determines the success of cochlear implants? Duration of deafness – patients who have been deaf for a short time do better than those who have been deaf a long time. Age of deafness onset – those who have lost their hearing after speech and language has been developed have better success. Age of implantation – the younger you are implanted the better. Duration of implant usage – experience with the cochlear implant increases success. Health of cochlea – higher number of nerve (spiral ganglion) cells one has within the cochlea, the better.